I'm going to go into this review with a disclaimer that I might have enjoyed Property much better had I not read and been extremely moved by [b:Escape|818811|Escape|Carolyn Jessop|http://d.gr-assets.com/books/1320470328s/818811.jpg|2782429] and [b:Stolen Innocence: My Story of Growing Up in a Polygamous Sect, Becoming a Teenage Bride, and Breaking Free of Warren Jeffs|2659997|Stolen Innocence My Story of Growing Up in a Polygamous Sect, Becoming a Teenage Bride, and Breaking Free of Warren Jeffs|Elissa Wall|http://d.gr-assets.com/books/1255629380s/2659997.jpg|3340863] a few years back. Both of those books are hard acts to follow, especially Escape, which had me on the edge of my seat wondering how the woman was going to get out from under the clutches of her abusive husband. I honestly think my body was completely wound up as I read the scene in Escape when Carolyn had only moments to execute her mad dash to safety.But it is what it is. 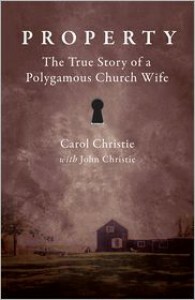 Carol Christie's account of life in a polygamous cult was meant to be told in its own right. Her experience was no less meaningful or unworthy of attention. I don't want to become so blase' about abusive spiritual leaders and sects to the point where I discount one person's experience as "less than" someone else's. As a non-fiction account, there is a message which needs to be brought to the masses. It is important for the outside world to know that abuse is happening in these closed-off communities.As a book for the purpose of readability, it was just okay. Entertainment is not the key reason for reading non-fiction and memoirs but I know that the more compelling the read, the more likely I am going to want to keep reading. It was easy enough for me to zip through Property because it was short. But I never felt an emotional attachment to the story the way I have with other, similar stories.Even with that, I picked up several key notes which bear repeating. If you've ever asked yourself why people stay in situations such as these, this book will clear some of that up for you. When a person is raised in a sect, away from mainstream information, it is literally all they know. Information about how to leave or even survive on the outside will never be freely given. The cycle continues on and on because it is all a person knows how to do, and fear is so instilled into the followers that they honestly believe the wrath of God will befall them should they try to escape.I'm going to go off on a personal ramble which ties into part of my fascination with cults and alternate lifestyles. A few of you know already that I've been working on a book which features a female lead who falls in love with a cult leader. This book is based from a few of my own personal experiences - one with a cult group I've interacted with, one from a business in my town that I've frequented which is run by a cult, and the rest from other random experiences I've happened upon. Several years ago, my husband and I vacationed in a small ski town and decided to wander into a local church one Sunday morning. The "pastor" (I use the quotes loosely because I've known and valued many honest and true clergy members) was using the pulpit to ridicule his members into submission, deriding them for tasks which they did not complete. He stood up there and yelled at his congregation until one of them finally jumped up and started in on the task in question. My husband and I gaped at each other (probably with our mouths open) and gave the signal that we needed to exit - immediately. This is not an example of a functioning and healthy church. This is an example of what people can find themselves pulled into for various reasons, whether it's being born into the situation and not knowing any better, or even in times when a person finally finds a place where they feel they belong (before the true nature of what goes on is revealed). Books like Property serve a purpose in the world : they allow us to see how atrocities like this do happen and that we should maybe not always be so quick to turn a blind eye to them.I wish that I'd known what to do in the situation above. Maybe my solution will be in writing about it. Maybe this was the solution (or even possibly therapy) for the author of Property in getting her story out there. While this book might not have been a grabber for me, I thank her for being brave enough to come forward, and I hope that she gets to reunite with loved ones and recover some of what has been lost to her.One last note : I feel that polygamy should not be the focus when reading books like these. Everyone who practices polygamy does so in a different way. Not every person practicing polygamy is in a cult, or is trying to force underage girls into marriage, or is an abusive person. When reading about religious sects, I try to only look at the situation at hand and not use it as a base to judge everyone who participates in a lesser-known lifestyle. Polygamy is legal and respectively practiced in many parts of the world.This book was provided from the publisher through Netgalley in exchange for an honest review.